We don’t have children so we don’t have a lot of toys around the house. However, Miles has a favorite ball that he loves. This entry was posted in Sunday Post and tagged 50 Year Project, Boston Terriers, Life, Photo Challenges, Photography, Photos, Sunday Post, Toys. Bookmark the permalink. I love the second photo. Miles is like a little model posing for you. He’s so cute :). I love Miles!!!! He is very photogenic!!! Miles is adorable. We now have a dog that actually likes toys. Previously they chose to play not with toys, but with things we didn’t want them to play with – cushions, shoes, cords. Miles truly looks like a poser! Some of Miles’s are as well. Awesome, boys(dogs) and their toys. Miles is a family member so he enjoys playing with his toys! Cute photos. I like the red ball. Oh, that’s so adorable! He looks so cute in his cozy little personalized blanket! Reggie is very particular about his toys. They must have squeakers in them which he promptly breaks in less than 5 minutes. Don’t be fooled by the “indestructible” squeakers. Not true, I’ve found out. Oh we’ve learned that the hard way. Maybe Reggie and Miles can have a competition and see who can get to the squeaker first. I just gave Reggie a new squeaky toy last night. This one is labeled “indestructible.” Ha.Ha. I highly doubt that. I should own stock in a squeaky toy company. You’d make millions because of people like me. I have some toys that I’ve been hiding, since he gets so sad when one disappears. I don’t want to break his little heart. Miles is adorable! You should do Miles Monday. Just sayin…. He would love it…he thinks he’s the coolest dog. He’s cute, holding his ball, Miles looks ready to play. 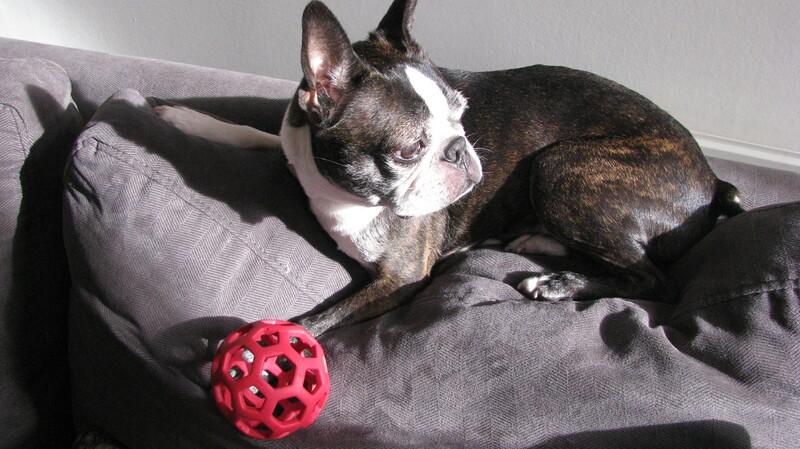 I bet miles have a lot of fun playing with his red ball toy. It does remind me of a similar ball made of wicker for a game I used to play called “Sipa-Takraw,” or kick and toss. Great images. Not many toys are needed. Otis has a toy box full, more toys than some kids have. Yet it is always the same few that he always plays with. I have been very lucky, Otis never played with anything that did not belong to him. 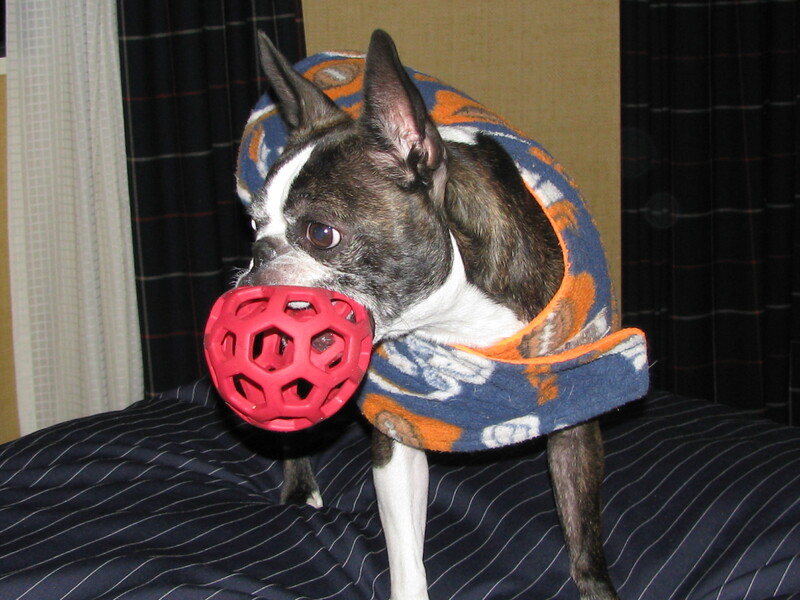 His favorites are stuffingless faux fur toys for in the house and a rubber ball for outside. BT’s are the best. A Boston Bull Terrier! – don’t see so many of these little guys but my grandmother had one, Danny, that I remember. So cute! Rocky has a basket of toys in the living room and he manages to get all of them out every day, even though he doesn’t play with them that much. Miles does the same thing. At night when I walk to the bathroom I trip all over them.